This is where I show and sell my art! ...if this is actually art. 8x10" hand built wood shadowbox with hand cut and painted wood shapes assembled into this colorful scene of a rocket zooming through outer space. Accented with an LED strand to light up the stars, activated by a momentary button at the bottom left. 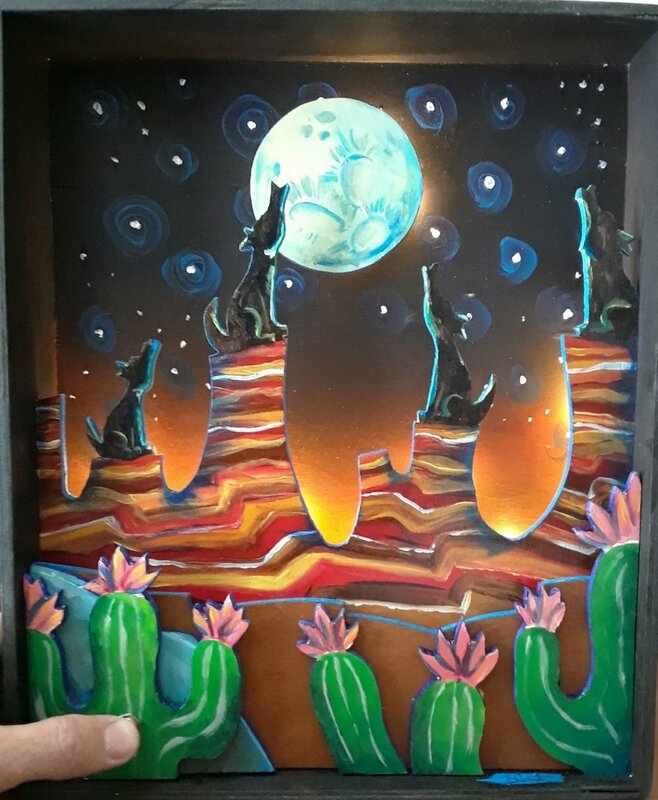 10X12" hand built wood shadowbox with hand cut and painted wood shapes assembled into a nighttime scene of coyotes howling at a large full moon. Accented with an LED strand to light up the scene, activated by a momentary button at the bottom left. 10X24" hand built wood shadowbox with hand cut and painted wood shapes assembled into a beautiful scene of colorful underwater exploration and adventrue. Accented with an LED strand to light up the scene, activated by a momentary button at the edge of the wave-y water. What is art though. Is it the creative expression of ideas that can be shared? Is it the physical manifestation of inspiration? Or is it something we just have to do? To use the skills and talents we have to make something beautiful with our bare hands if necessary.